The Erie Canalway Bike Path streches across over 350 miles of upstate New York, from Buffalo to Albany. Plan your trip using these maps and planning tools. Most of the Erie Canal Trail uses gravel paths along the route of the Erie Canal, although some sections use local roads. The trail will take you across almost the entire state of New York, including through the cities of Rochester, Syracuse, and Utica, plus many small towns and beautiful New York countryside. 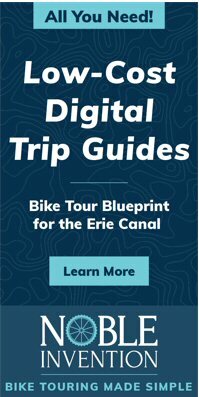 Where do you want to start your Erie Canal ride? Discussion board for Erie Canal Bike Trail comments, questions, and just plain talk. Get your bike, and yourself, from one point on the trail to another by train or bus. The Erie Canal Bike Trail is just the beginning. Explore one of these side-trails. Check current conditions along the Erie Canal. Erie Canal resources to include in your pack.